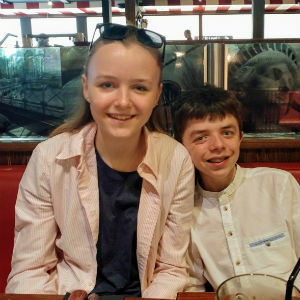 G finished her GCSE exams a couple of weeks ago, which coincided with B coming home, so we went out for a lovely meal to celebrate. Her attitude during the exam period was great – she worked hard but stayed pretty calm and relaxed, so we are very proud of her, so it was especially nice to go out all together to enjoy some proper downtime. 2. 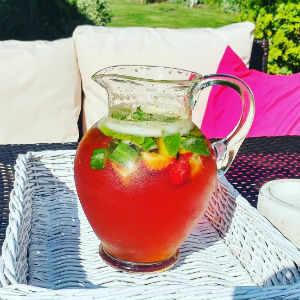 We eventually got everything finished off in the garden just in time for the glorious summer weather – the patio was finished, and the furniture and hot tub arrived, so we spent just about the whole weekend outside enjoying it – with the odd glass of Pimms, of course! 3. G and I then headed over to Norfolk for a couple of days, which was such a treat. It was so lovely to have that time with her, again in the sun! 4. 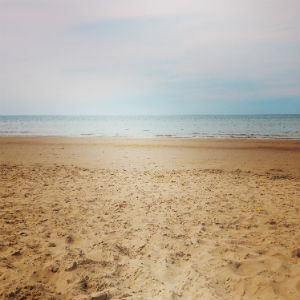 We mostly spent our days going to lovely places for drinks and reading on the beach – this is always one of my preferred things to do and I am thrilled that G now enjoys this too, as it combines two of my favourite things – books and beaches! 5. We then had to head home a little earlier than usual to ensure that my studio was ready to accept my first customer! I am so pleased with how it has turned out- it is exactly how I imagined it and suits my needs perfectly. 6. So last week saw me accepting my first Smarter Wags’ customers, all of whom were so lovely. It is so good to be working properly again, rather than just training. Exciting times! 7. 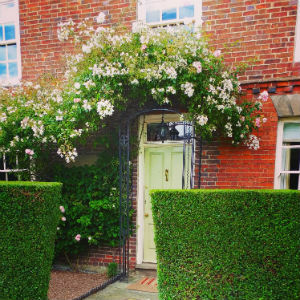 We had a really lovely couple of days last weekend when one of my university friends came to stay. 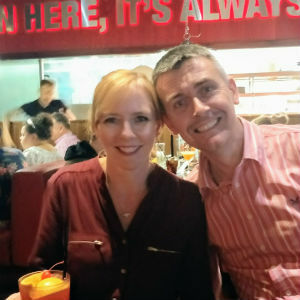 Although we stay in touch via email and telephone, it is always so nice to have a proper catch up in person – I’m just not sure where the time went! 8. 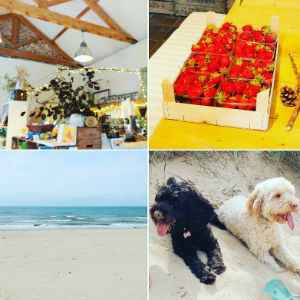 We had a pretty relaxing weekend – to make time for all that talking that had to be done! 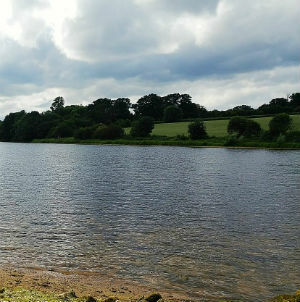 The most we managed was a nice walk and drink at Calke Abbey on Saturday afternoon, then morning coffee at Mercia Marina on Sunday morning – my kind of weekend! 9. 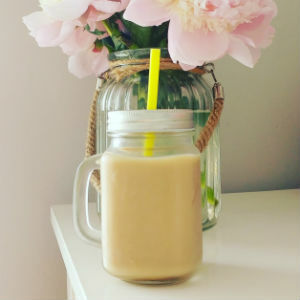 Talking of drinks, my new favourite is homemade iced coffee – I love it! It’s just a shame that the weather hasn’t exactly been suitable for iced drinks this week. 10. So my final one for this week is G’s prom, which was held on Monday. I haven’t seen many proper photos yet, as she got ready with friends elsewhere and then went straight off to NCS for the rest of the week on Tuesday morning, so I’m looking forward to seeing them when she gets home tomorrow night, but she had a really lovely time and, from what I have seen, looked beautiful. And she even enjoyed the dancing – for the first time ever! So we have a nice weekend ahead. B and G will both be home, which will be nice, then we are heading off to North Yorkshire at the start of next week for a quick overnight stay. Fingers crossed for an improvement in the weather! 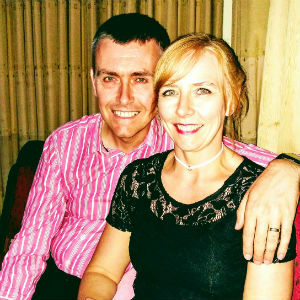 We went to a great Robbie Williams tribute night on Saturday at Branston Golf and Country Club, which was a good night out – we had a nice three course meal, followed by the act, Dan Budd, who is a very good Robbie (and his Gary Barlow impression is uncanny!). 2. We then spent a wonderful afternoon at my sister and brother-in-law’s house, celebrating the upcoming wedding of my niece with the most beautiful afternoon tea. 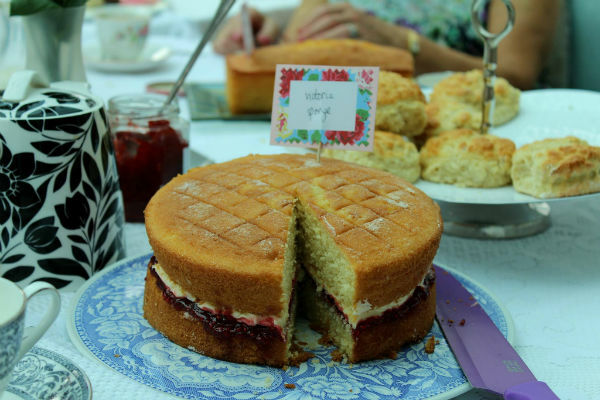 The table was so pretty, with vintage China and roses from the garden, and the food was fabulous, especially the delicious array of cakes. It was a lovely afternoon, and a great way to celebrate. 3. 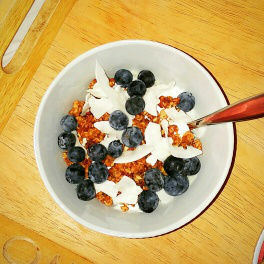 Over a lot of serious over-indulging at the afternoon tea, healthy eating had to resume this week – this has been my favourite breakfast of the week, which is a great start to the day – Greek yogurt with honey, homemade nutty cinnamon granola, coconut flakes and blueberries. 4. Tuesday evening saw me heading out for a meal and theatre trip with my lovely friends, Hettie and Lindsey. We had a very tasty Mexican meal, then watched “A Judgement in Stone”. We have seen such a huge range of productions at Derby Theatre – comedy, musicals, plays – both “home-grown” and nationally touring – and nothing has ever disappointed. However, this, despite being a Bill Kenwright production on a large national tour, came the closest. The first half was pretty good and we were sufficiently intrigued, but the actual denouement really was rather a let down, with the final lines in the play being quite ridiculous. This did not detract from it being a great night out though with the nicest friends. 5. 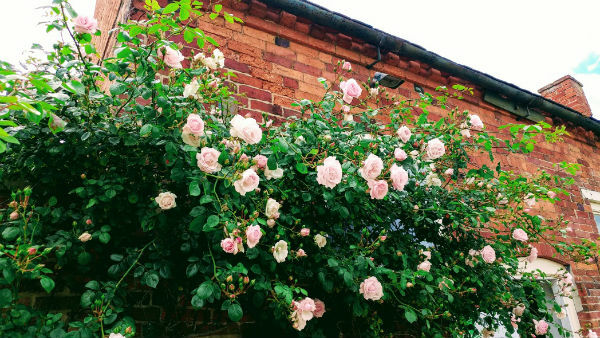 I have decided that I need to get a rose for the garden, as I absolutely love them and seem to have come across some beautiful specimens this week, from my sister’s very impressive rose garden to ones growing and blooming wonderfully on the wall of the charity shop that I volunteer in, to the “doorway of dreams” that I spotted whilst out and about this week. Stunning. 6. 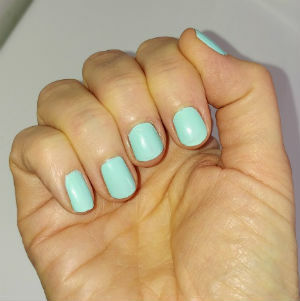 Some simple everyday things have made me happy this week, such as the new nail varnish I bought last Friday – lovely mint colour – and my amazing peonies, which have graced the sitting room this week. Sadly they have now died, so hopefully I can buy more whilst out shopping today. 8. 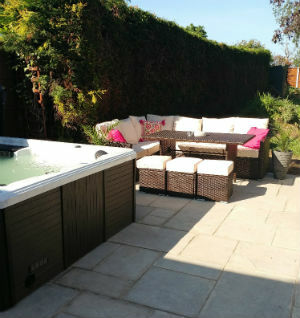 Just in time for the end of exams and the promised hot, sunny weather, we eventually took delivery of our hot tub yesterday! It came early in the morning and so was ready to use later in the day (not soon enough for G’s liking, who kept checking the temperature at VERY regular intervals to see if it was ready!) but we had two sessions in it – G and I tried it out as soon as it (almost!) hit the right temperature, and then again when D came home – our first “double bubble” night – prosecco in the hot tub. I can recommend it! 9. We have been eating a very low sugar diet for quite a while now, and have found some really lovely recipe books over the past few months with great sugar-free recipes in – Fearne Cotton’s and Clean Eating Alice’s are particular favourites – but on Saturday, at our lovely little library, I found two of Davina McCall’s sugar-free cookbooks, which look fabulous, so I am looking forward to trying some of her recipes over the next few days. 10. Well, we are hoping for a really fantastic weekend! We have quite a few “chores” to do, which mainly involve cleaning and tidying everywhere after the builders leave, and getting my studio fully ready to open next week, but we are also going to make sure that we fit in some fun things. B comes home tonight, so we are going straight out for a meal to celebrate the end of G’s exams, then we are hoping that the forecast weather does arrive, so that we can spend lots of time outside, especially on our new garden furniture (once the screws arrive tomorrow – yesterday the furniture arrived but with no fastenings or instructions!) and in the hot tub. Lovely!! Sunny walks have been few and far between this week – what a washout it has been for the most part. However, the sun has been even more welcome when it has put in an appearance. Let’s hope we see more of it over the coming days and weeks. 2. 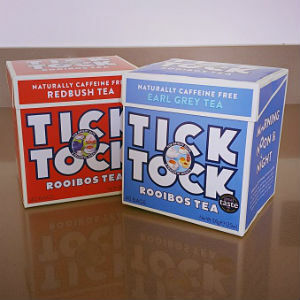 After being aware of it for a while and then seeing a TV programme about it on Monday, we have eventually tried rooibos tea this week. It is supposed to be very good for digestion, amongst other things, so we thought that it was worth a try. We have so far sampled the original and the Earl Grey varieties, and are suitably impressed. 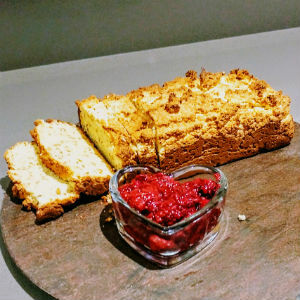 It has a very different taste, but it is quite nice and very versatile – my favourite way to drink it is with lemon – delicious! 3. 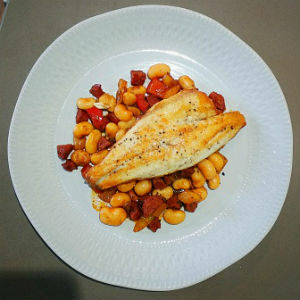 My favourite meal of the week has to be this seabass with spicy chorizo and bean stew. 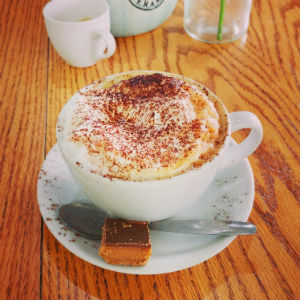 There are so many amazing flavours involved – and it is good and healthy! 4. We had a lovely family night in on Saturday, to make the most of B’s last night at home before he went back to school on Sunday. We had a takeaway (in fact, we had two – a savoury and a sweet! ), watched the final of Britain’s Got Talent (very disappointed with the winner though!!) and then all had a “sleepover” in the sitting room. Great night enjoyed by all! 5. 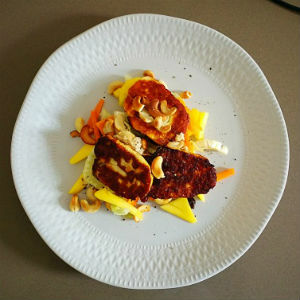 Another hit on the food front this week was this halloumi salad with mango and fennel – light and refreshing and delicious. 6. 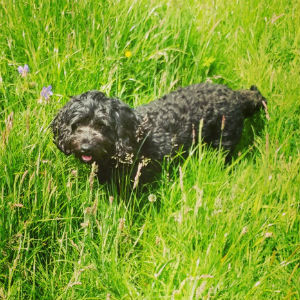 This week has seen me pushing ahead with the marketing activity for my dog grooming business. I have collected (and begun distributing) my flyers, collected the sign for our gatepost which I am hoping that D will put up this weekend, and have had adverts published in two local free magazines. 7. 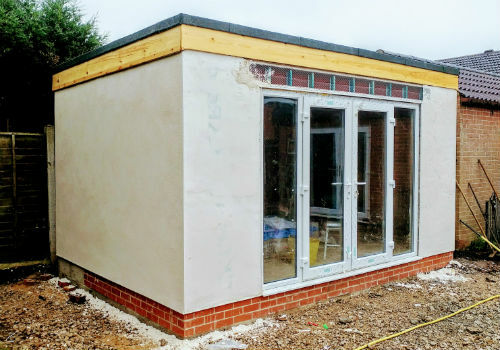 The rain has caused some delays to the work being done at home this week, but progress is now being made with the patio, which will hopefully be completed by the time that the hot tub arrives next week! 8. 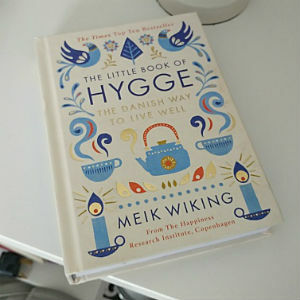 I have been interested to ready more about hygge for a while, so was really pleased to receive this book for my birthday a few weeks ago, and I have made a start on it in the past couple of days. So far, so good – I love everything about the hygge manifesto! 9. I bought some stargazer lilies when I was food shopping last weekend and they are now beginning to bloom beautifully. 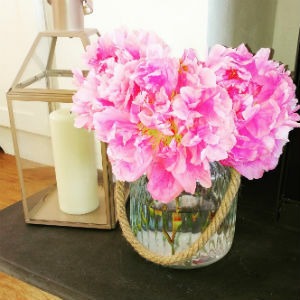 I absolutely love them, as I had them in my wedding bouquet, so I am enjoying seeing and smelling them whenever I go into the sitting room. 10. We have a lovely weekend ahead, which I am really looking forward to. Apart from the fact that G is nearing the end of her exams, which is relieving the pressure and the amount of time that she will have to spend revising, we are going out tomorrow evening to a Robbie Williams tribute night, which should be lots of fun, then we are heading out for a champagne afternoon tea on Sunday afternoon to celebrate my niece’s upcoming wedding, which is very exciting. 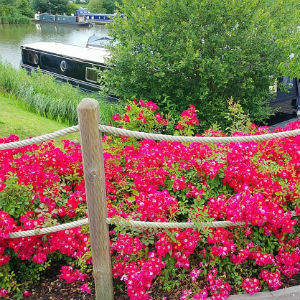 So, we have everything crossed for dry weather and sunshine, so that we can make the most of the weekend and work can progress on the patio over the next few days. More healthy new recipes have been tried and tested this week, and all of them have been great hits. 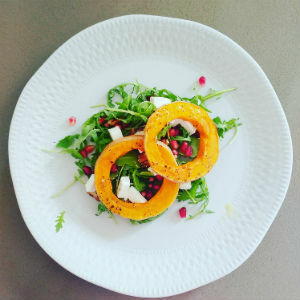 Two of my favourites were the Breakfast Bread with homemade Raspberry Chia Jam, and then the Squash, Feta and Pomegranate Salad. 2. This has been a week with a strong focus on family time, with B being home from school. As we have been lucky enough to have some lovely weather, we have spent a lot of time (in-between revision sessions) in the garden – the impromptu obstacle course that G and B set up and did on Sunday was hilarious to watch! 3. 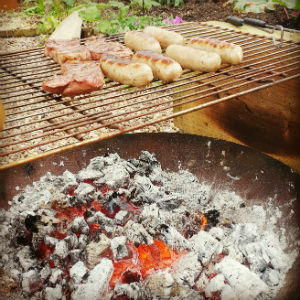 This was followed later on Sunday with a fire pit, which we then decided to use to barbecue our evening meal on – unplanned barbecues are the best – and we love eating outside, so it was great. 4. Although Monday was a bank holiday, it was also the final day of my dog grooming course. The past four months have passed so quickly, but so enjoyably – I have loved doing the training, the group were great, and we couldn’t have asked for better trainers. It was an interesting last day – my most unsettled and aggressive dog to date (I still have the scratches and bruises to prove it) – but it was a good learning experience, and we then finished the day with a trip to the pub across the road, where our trainer had organised for some fizz to be waiting on ice for us, which was a lovely surprise. It will be very strange not going for more training next week! 5. 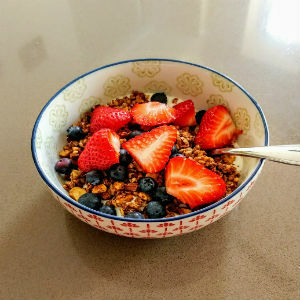 Homemade Nutty Cinnamon Granola – the best! I have made a few different granolas over the years, but this new one is definitely my favourite, and is fabulous with Greek yogurt and fruit. 6. 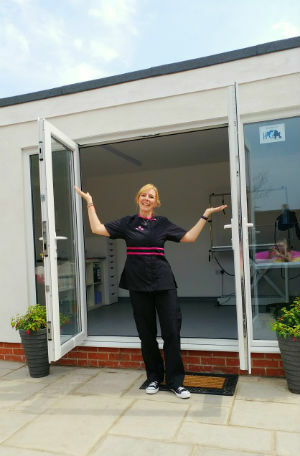 This has been a busy week, as my new building, which will be my dog grooming studio, is nearing completion, so D and I have been painting it inside. It is all looking good, so we are getting excited about the final bits being done now – the plumbing and electrical work will be completed over the next few days, the flooring will be fitted by the end of the weekend and my final delivery of equipment arrives today. 7. I have to say that I had been absolutely dreading this week – revision week! G is obviously very much in the swing of revision, being in the middle of her GCSEs now, but it is always a huge battle to get B to see the importance of revising for his exams, so I was expecting lots of stress and frustrations this week. However, on the whole, he has settled to it pretty well, and has done a lot more than in previous years, so it has been a very positive week. 8. 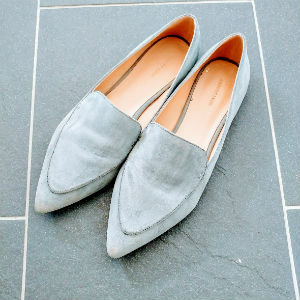 My new shoes from Abbott Lyon – love them! 9. Last night saw me heading over to Oakham for a night out with a university friend. We had such a great night – a really good catch up, plus lots of delicious food and drinks – so I can’t wait to do it again in August! 10. It’s June! And the significance of that is that we can say that we are going on holiday NEXT MONTH!! To say I am excited about that is an understatement – St Lucia here we come (soon!). So here’s to a lovely, sunny weekend (hopefully!). What are you up to?